Reclaim Your Health #1 Add Salt and Get Younger! Reclaim Your Health #1 ADD Salts Get Younger! A great anti- ageing strategy. Bicarbonate of soda, better known as baking soda or sodium bicarbonate, has numerous uses–it’s a cleaning agent, antacid, fire extinguisher and more. There also are interesting health benefits when you drink baking soda, which is alkaline, in water. Viruses and diseases such as colds, flu, cancer and even heart disease thrive in an acidic body, but cannot survive when your body is alkaline. The 2009 Journal of the American Society of Nephrology revealed a study of 134 patients with advanced kidney disease. Taking baking soda daily dramatically slowed down the progression of kidney disease, resulting in no need for dialysis. To increase your body’s pH, take 1/4 tsp of baking soda dissolved in one-half glass of water on an empty stomach, once in the morning and again before bedtime. Acidity and alkalinity is measured by pH, which ranges from 0 to 14 with 7.0 being neutral; a pH above 7.0 is alkaline, and below 7.0 is acidic. Baking soda has the highest pH of 14. Create a healthy body by keeping your body’s pH between 7.1 and 7.5. Drink the baking soda and water solution at the very beginning of cold or flu symptoms, such as a runny nose or sneezing, to help kill the viruses. Keep your body alkaline by increasing fresh fruits and vegetables in your diet. Baking soda, or sodium bicarbonate, is a staple in many homes for baking and cleaning purposes – but there’s a good chance you’re not taking full advantage of all that baking soda has to offer. For instance, did you know there’s a whole gamut of medicinal uses for baking soda, such as safely removing splinters from your fingers, or just brushing your teeth? However, it wasn’t until 1846 when Dr. Austin Church and John Dwight began to manufacture and sell the compound we know as baking soda today. By the 1860s, baking soda was featured in published cookbooks, and in the 1930s was widely advertised as a “proven medical agent.”1 Come 1972, the idea to keep a box of baking soda in your fridge to keep food fresh was born, and it really caught on … raise your hand if you have a box in your fridge right now! Not too certain though about how valid the pH optimizing is as to baking soda’s mechanism of action, as clinically I have frequently used diluted hydrochloric acid intravenously to also help people nearly instantly recover from acute infections. Obviously this is pushing the pH in the opposite direction, yet both appear to work, suggesting that the mode of action may be other than pH mediated. Sunburn remedy: Add ½ cup of baking soda to lukewarm bathwater, then soak in the tub for natural relief. When you get out, let your skin air dry, rather than towelling off the excess baking soda, for extra relief. You can also add a mixture of baking soda and water to a cool compress and apply it to the sunburn directly. Enhanced sports performance: Distance runners have long engaged in a practice known as “soda doping” – or taking baking soda capsules — before races to enhance performance, a measure that’s thought to work similarly to carbohydrate loading. While I don’t suggest you try this at home, it’s another example of baking soda benefits. Foot soak: Add three tablespoons of baking soda to a tub of warm water for an invigorating foot soak. It will soften hard skin and corns. Detox bath: Baking soda and apple cider vinegar make a wonderful spa-like bath for Detox – soaking away aches and pains. It also cleans the bath and the drain, as a bonus! 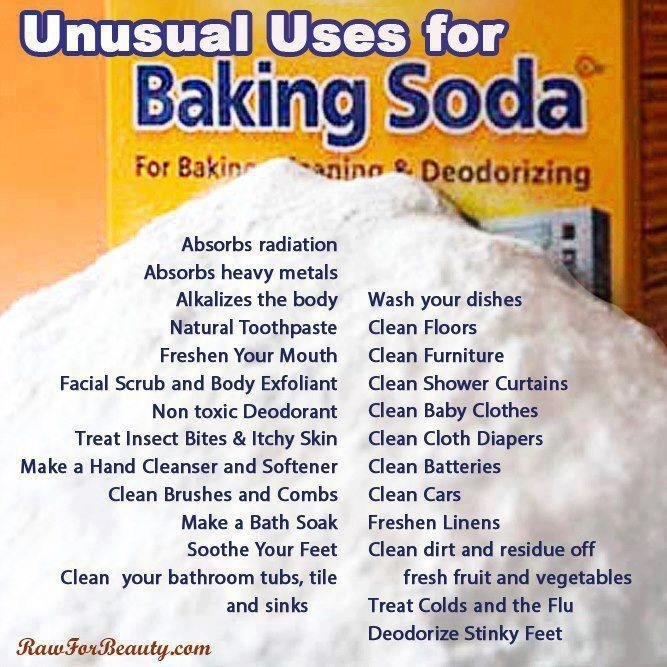 Baking soda is great to scrub your bath and kitchen with. Just sprinkle the baking soda on the surfaces and scrub. Add a few drops of your favorite essential oil to its’ storage container. Lavender and tea tree oil have potent anti-bacterial qualities. Baking soda can also be used as a fabric softener in your laundry, or to get your clothes whither and brighter (add ½ – 1 cup to your laundry load). To polish silver without using toxic silver polish, fill your kitchen sink with hot water, add a sheet of aluminium foil and baking soda, and let the silver pieces soak until clean. It is an easy and fun way to clean silver. In the event of a minor oil fire in your kitchen, use baking soda to help smother out the flames. Combine three parts bicarb to one part liquid hand soap to create a scrubbing hand wash. This will power away tough grime and dirt without irritating the skin, leaving it soft and smooth. In certain illnesses, such as gout or kidney disease, the levels of acid in the bloodstream or urine can become excessively high. Bicarbonate of soda can be administered either orally as a tablet or powder or intravenously in controlled medical situations where acidosis of the body occurs. When using bicarbonate of soda, ensure it is completely dissolved before taking the solution. Do not take sodium bicarbonate solution as an antacid on a full stomach. If you are on a low sodium diet, taking prescription medications, administering to a child younger than 5 years old or if symptoms last for more than two weeks, consult your physician. Not bad for around £1 a box, right?